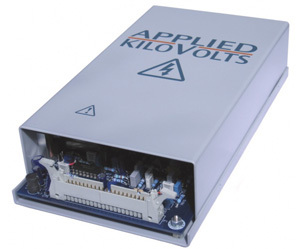 This power supply provides six outputs each separately programmable from -200V to +200V with respect to Gnd. It is intended for steering, focusing & biasing of electron & ion beam applications. Biasing steering plates in pairs, this can control X, Y & Z directions. Each output is controllable cleanly through zero. Please consult the factory for special variants of this supply including high speed versions. +24V dc ±0.5V <0.5A. 0V input common to HV return and chassis. +15V dc ±0.5V <0.5A , & -15Vdc ±0.5V <0.05A. Protected against intermittent arcing and continued short circuit to ground. While able to source or sink 100uA, the unit will be damaged by sustained sinking of a beam current in excess of 200uA. (Thomas & Betts 635-4034ES) Mating connector supplied.